Add Strength to your Survival Plan! James Walton “I Am Liberty” Audio player below! Fitness doesn’t have to be tied to a gym membership. Though it may seem like having a gym membership is key to getting in shape you don’t actually have to step foot into a gym to get fit. Some of my favorite gear for getting a good workout is sitting in my living room. Listen to this broadcast or download “Add Strength to your Survival Plan” in player! I won’t lie to you working out at home takes serious dedication. You need to have the drive and the inspiration to get off your couch, away from the video games and push yourself through a tough workout. 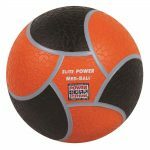 The medicine ball is one of the best items around for getting a serious core and cardio workout. At home, I keep an 8lb ball that my wife and I can use. In the gym, I will use up to 20lbs on core exercises. The medicine ball eliminates excuses because you can do minimal effort and come away with a great workout. The medicine ball is also great for team workouts. Some days the heavy bag becomes my high impact cardio workout. It doesn’t always have to be running hills. My favorite workout is to go 5 rounds at three minutes each. This is your typical Muay Thai bout. Having the heavy bag gives you many options. When you are committing to work out and working out at home you need options. If you have a few different sizes of kettlebell you can tap into some serious strength and mobility. I keep a 25lb bell around for things like windmills and then I have the 60lb Werewolf that mocks me through the whole workout. He’s a beast. They make em bigger and smaller but this is what I use most. Kettlebell training will require you to learn some basic movements first. If you just go in there winging around heavy kettlebells you are gonna lose a rotator cuff or pull your back. Go take an intro class. For basic warm ups and mobility there is nothing like a quality jump rope. This can be a great way to get your heart rate up and muscles warm for a kettlebell workout. Its also a great warm up for your heavy bag workout. If you’re talking in home fitness gear, both pre and post shtf, these are the fantastic four. We discuss them in greater detail in player provided above. Visit I Am Liberty website HERE! Archives, coming shows & more for Visit I Am Liberty HERE! Previous: Previous post: US Banking, Currency and Economy! Next: Next post: Weapons, buying, caring for, and using knives and guns!